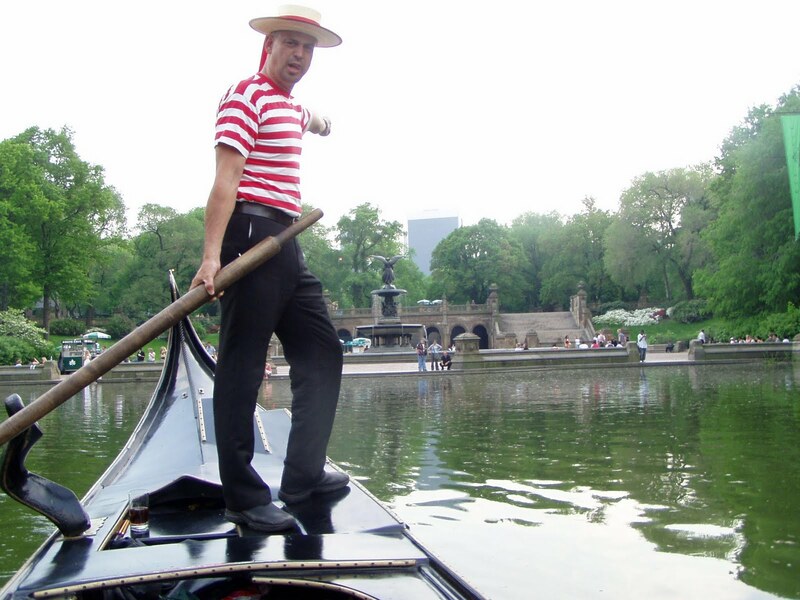 A hard-working gondolier tends to wear many hats. He's not just a boat rower. 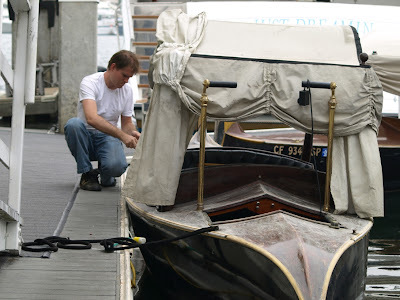 We've looked at some of the qualities of a hard-working gondolier in two earlier posts. Lets take a look at things from a "work" perspective, and add some more attributes. He's not afraid to flip his boat over now and then and reach for tools and supplies. 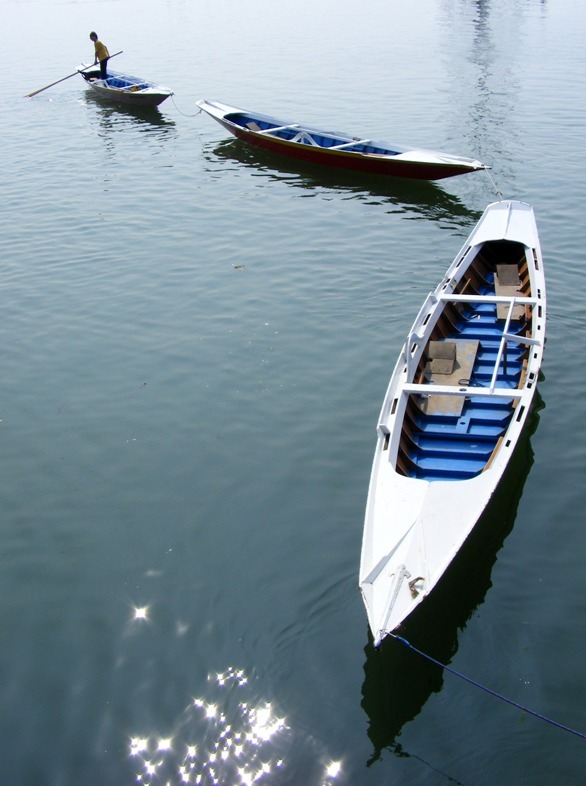 From the post "Getting to the Bottom of Things"
Of course "full boat" can have many different meanings depending on the place or the situation. 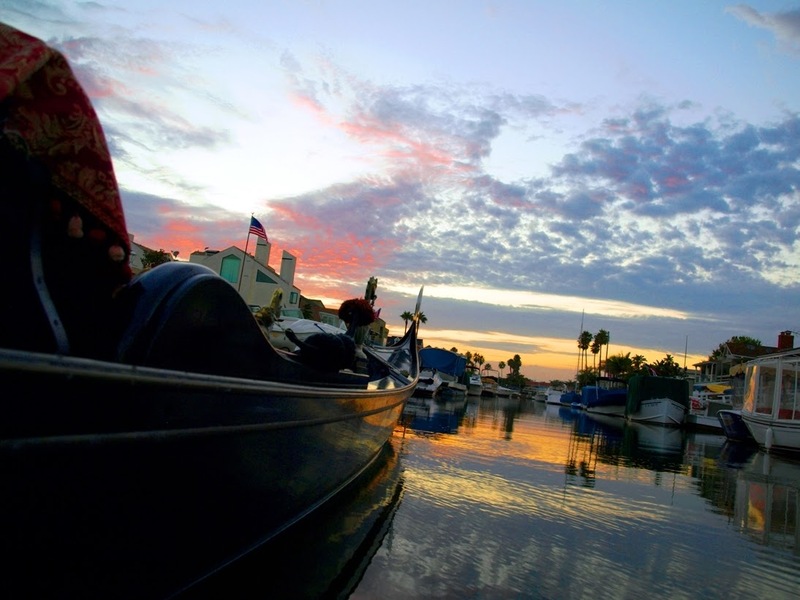 In some places there are regulations limiting the number of passengers in a boat, but a hundred years ago there were no such laws in Venice, California. A photograph-based postcard from Abott Kinney's "Venice of the West" shows us just how many passengers you can jam into a gondola. No doubt the added weight must have made for a much harder row for the hard-working guy on the back. Sponges, sessolas, and of course, the traditional chamois. Rags, cleaning products, waxes, and a collection of other items also are a regular part of his day. A hard-working gondolier also doesn't hesitate to jump aboard and clean the heck out of his boat to take out a last-minute cruise. The above photo is from my post "Servizio Gondola Ferrovia". Not all gondoliers have the additional task of interfacing directly with potential clients, and trying to convince them to take a cruise. I believe this is one of the biggest differences between Venetian gondoliers and their American conterparts. They are not only boat captains, they are also sales staff. 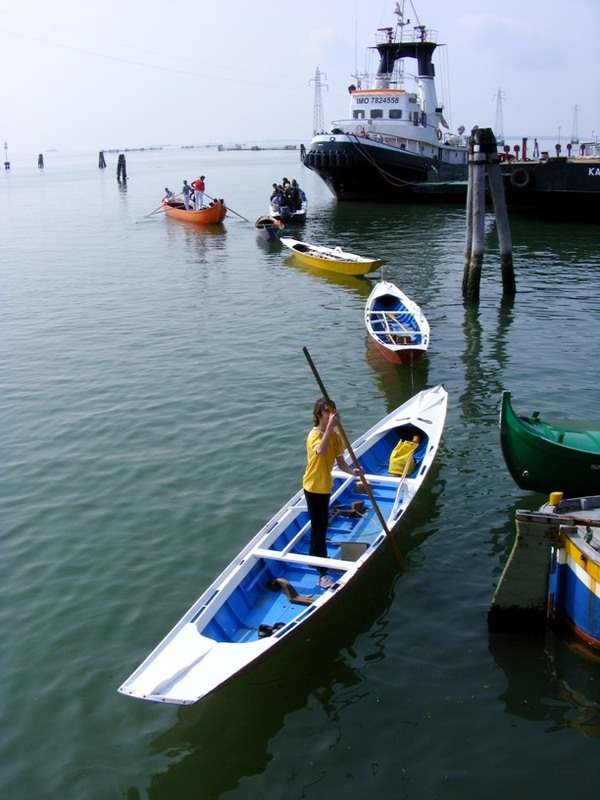 Of course there are a few dedicated rowers outside of Venice who do mix it up and haggle with walk-up clients, in front of restaurants, along boardwalks, and at the home dock - whenever someone strolls by looking for a cruise. The photo above may look familiar; it comes from "The Negotiation". There are very few gondoliers out there who love money so much that they'll go the extra mile on an unfailing basis. 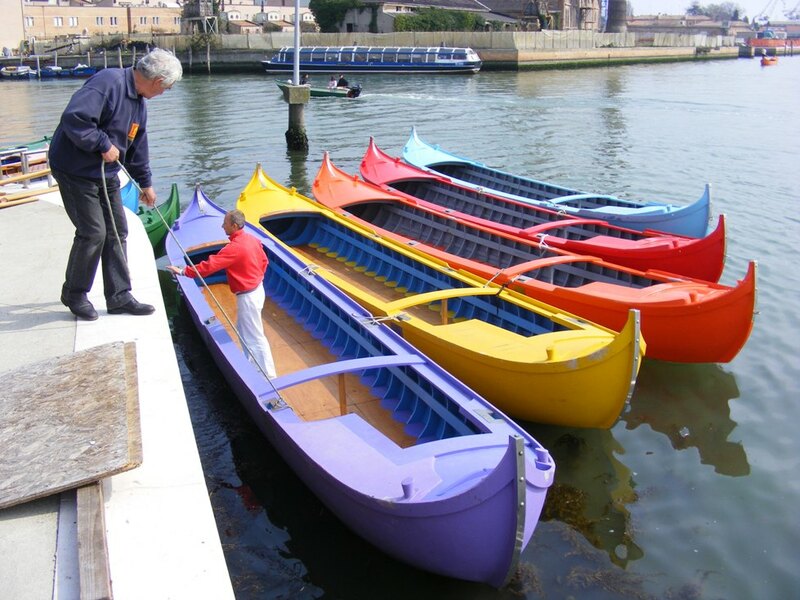 And sure, lots of gondoliers who are worth their salt, have a real love for the rowing part. Many of us look forward to the interaction with our passengers. When it comes down to it though, one thing hard-working gondoliers all share is a love for the boat. but watch them for a while and you'll see it. This is not just another type of boat. 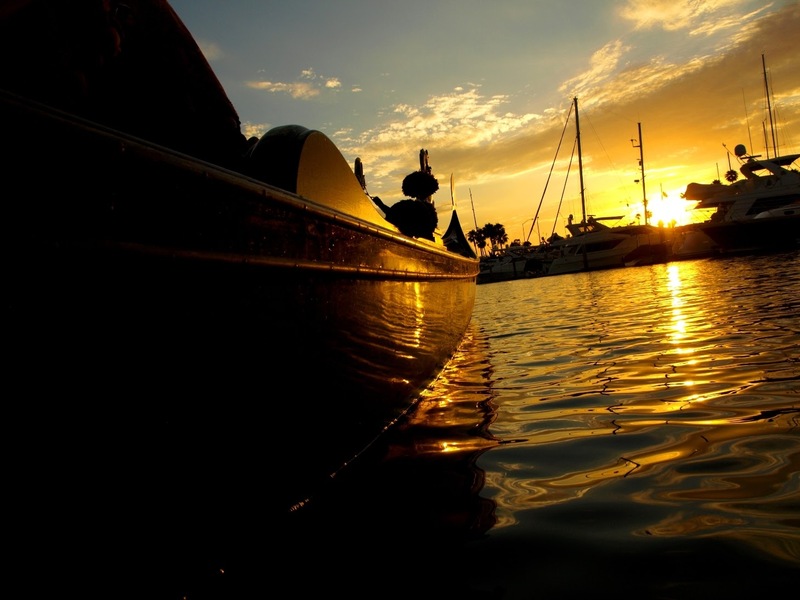 Schooners, runabouts, offshore racers, Chinese junks - they are all unique types of boats. 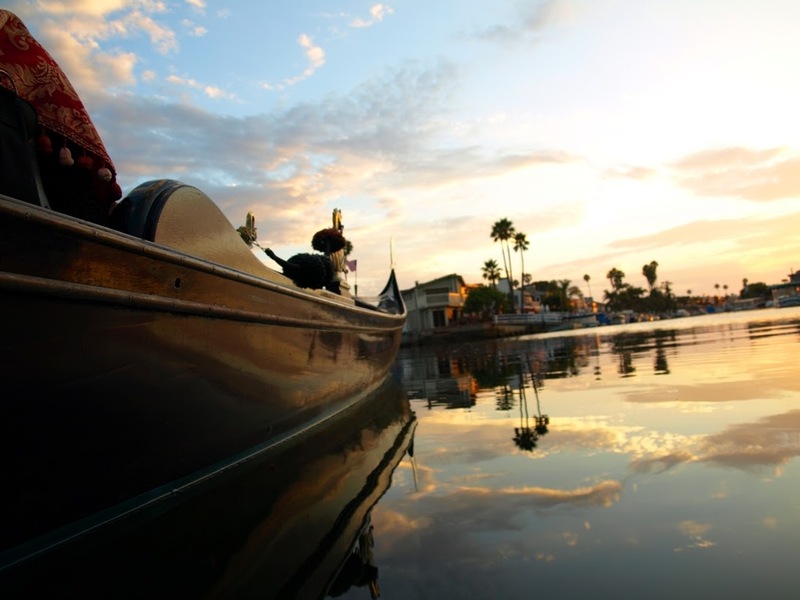 But a gondola is so much more than just a boat. so I'll save it for another time. The photo above, of Franco Bognolo in Denmark says it all. That man loves his boat. And by the look of his clothes, he's been working hard to keep her in top shape. 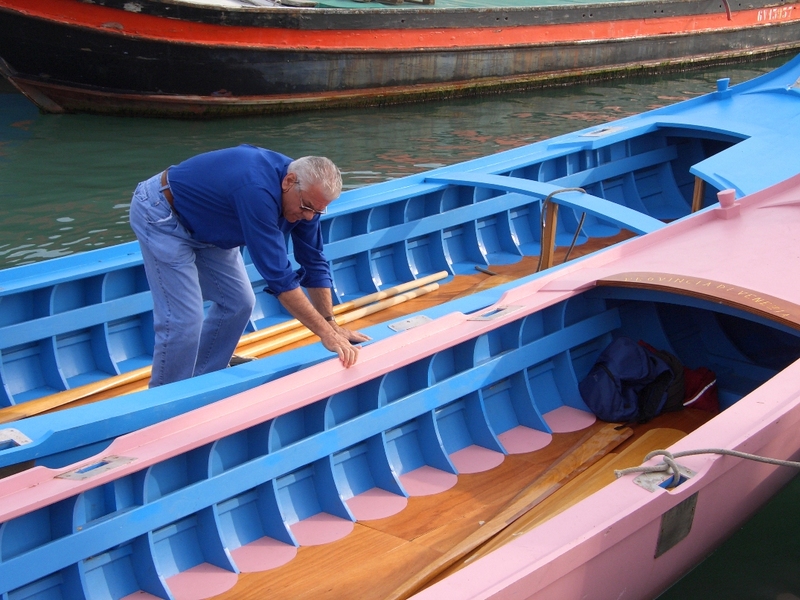 Some of you have chimed in with some of your own ideas of what makes a hard-working gondolier. Be careful - if you keep it up, I might just throw together another post using reader comments. Some of you may have already seen this - following the link from John Synco's comment. It's a little less off-topic than my "River Surfing in Germany" post, simply because it takes place in Venice, and there are gondolas (even though they are in the background most of the time. I fully support the SUP craze, but all-the-same, I cannot emphasize enough the fact that this is not rowing, and far from voga-alla-veneta. Alora, take a look at "Surfin' Venice 2011". I try to keep everything here relevant. gondoliers - they are often the most interesting topic of all. but I'm pretty sure many of you will find it interesting. Considering how many gondoliers love adventure, and have an affinity for travel, I think this is worth posting. and I'm certain this will interest them. shot this while in Munich. Check out "Munich River Surfing". Anyone out there know how to say "Cowabunga!" in German? 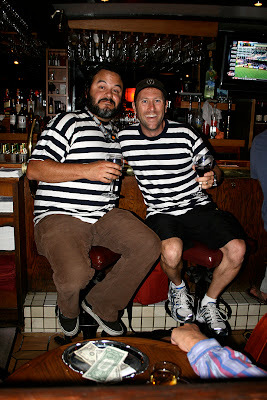 Last night a bunch of us California gondoliers and friends got together to give a proper send-off to John Synco and his wife "Trish the Dish". The Synco family will be moving to the Seattle area soon - a great loss for So Cal as far as I'm concerned. I was unable to get there until halfway through, but fortunately John had his camera and tripod, so a "usual suspects" photo was taken. 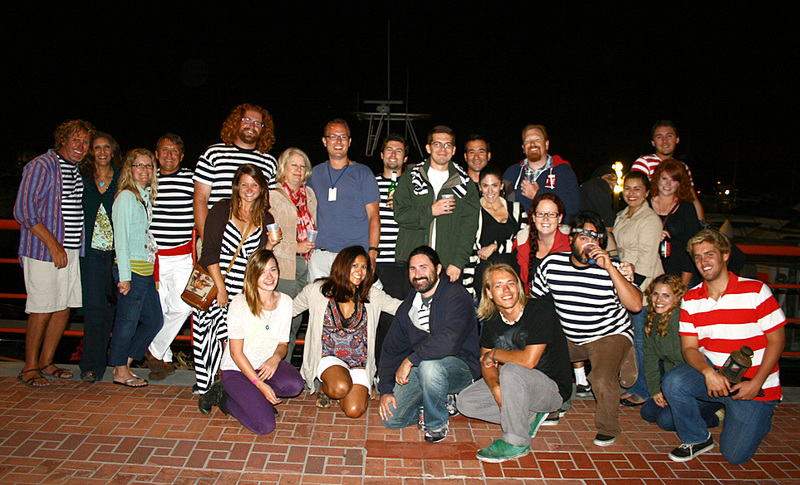 By the time I met up with everyone, they'd already rowed to Captani Jacks, and everyone was already well-marinated. It was a great, and noisy time, with lots of singing (rarely on key). Next, evryone jumped on the boats. and made him sit as a passenger. Under the bridge John shot this interesting exposure under the bridge as I sang something in latin. More photos are sure to come, maybe some video too - although last night's recordings were a lot less, um, professional than ones we've captured at past get-togethers. I've been waiting for this post to go up for a while. Not surprisingly, Erla's writing does not disappoint. Read her most recent post "Turkish Delight: Gondolas on the Bosphorus". You'll wish you were there. Steve Elkins is my senior gondolier in Newport. He's an expert at both rowing and piloting our motorized vessels. 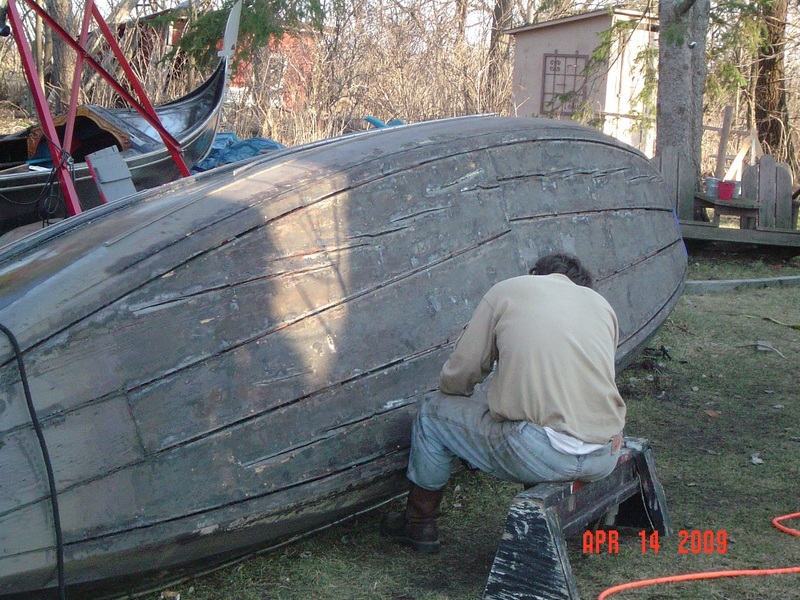 Years ago Steve started with some simple tasks - assisting me in prepping boats for haulout or painting. Bit by bit he learned the steps and methods involved. In short time he was taking these projects on by himself. 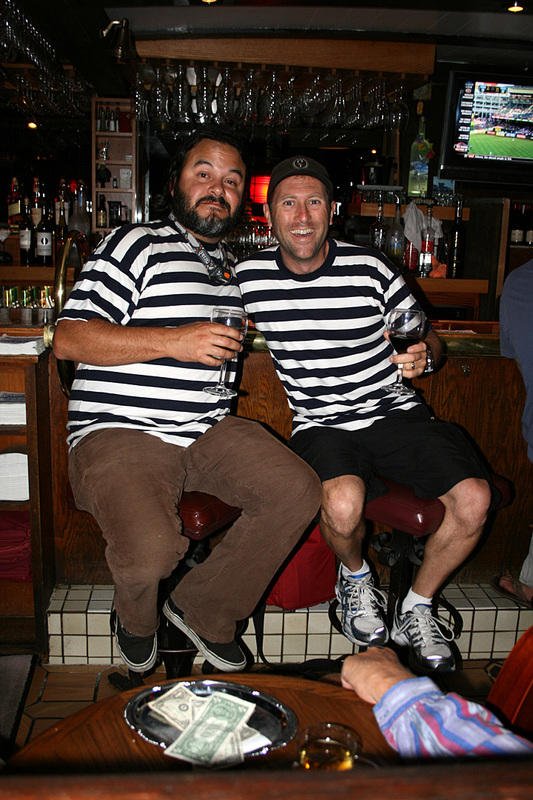 In Newport, Steve is my right-hand-man. Today was Steve's birthday, and while I'd like to have gotten this post up sooner, I had my hands full with a birthday party of my own (my daughter's birthday party brought around sixty people to our house). But now, as I sit at my desk for the first time all day, enjoying a much needed glass of vino rosso, I raise my glass in toast to Steve Elkins. Photographer, rower, and all around great girl. Martina Zane is one of my very favorite people. Like almost all Venetians, she's a natural tour guide. She also has great skills in translating, and served as our official translator on the expedition down the Hudson River in 2007. Hunt around the Gondola Blog and you'll find a number of excellent photos by Martina. As I mentioned in my earlier post, I set out with a plan to come up with a few qualities of a "hard-working gondolier". An hour later I'd assembled enough for three posts. In the mean time I've heard from friends who've offered a few good suggestions as well. 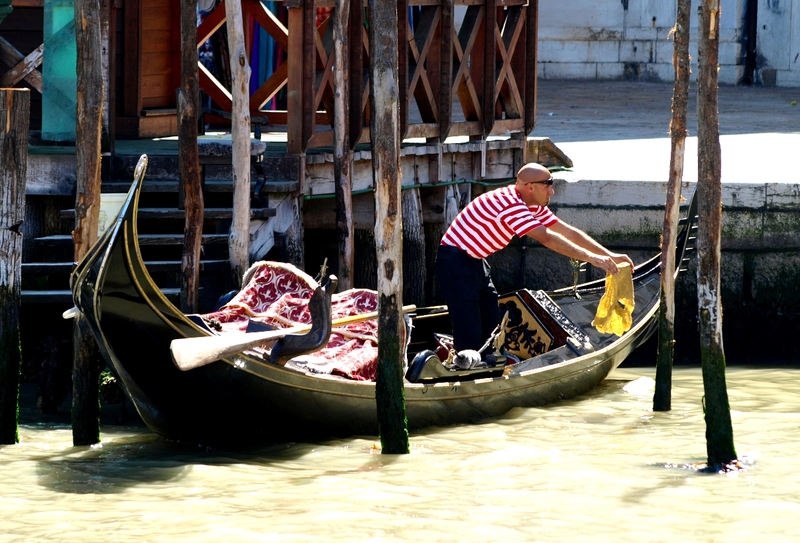 A hard-working gondolier is the one who works so hard that he (or she) makes other gondoliers look bad. And yet typically doesn't draw attention to themselves overtly. The work ethic speaks for itself. Here's today's list of attributes. He spends time with other hard working gondoilers. 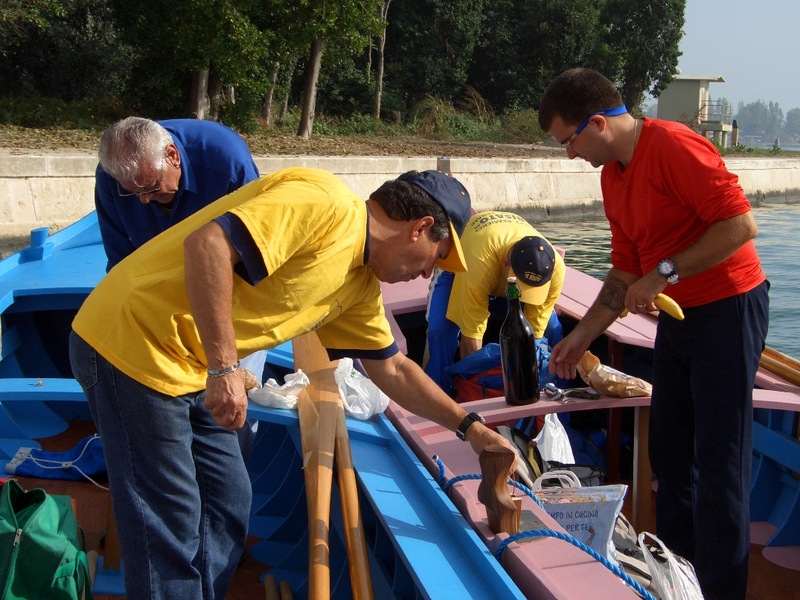 A hard-working gondolier recognizes others with the same appreciation for dirty hands and sore muscles. A zest for life also seems to go hand-in-hand with such an attitude. The above photo is part of a sequence in "Recent Activity in Squero San Trovaso" from August of 2008. A boat full of children doesn't scare him. "Never work with children or animals". But in our trade we have to smile and welcome just about anyone who walks down the dock to ride on our boats. "A Hard Working Gondolier never complains when his gondola is filled with smiling passengers from around the world." Suffice to say that we need to be ready for anything. 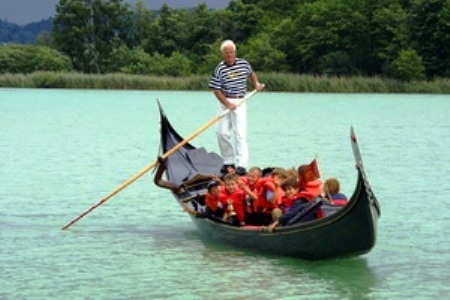 The photo above is of Ingo Stahl in Wörthsee - a lake in Bavaria, Germany. 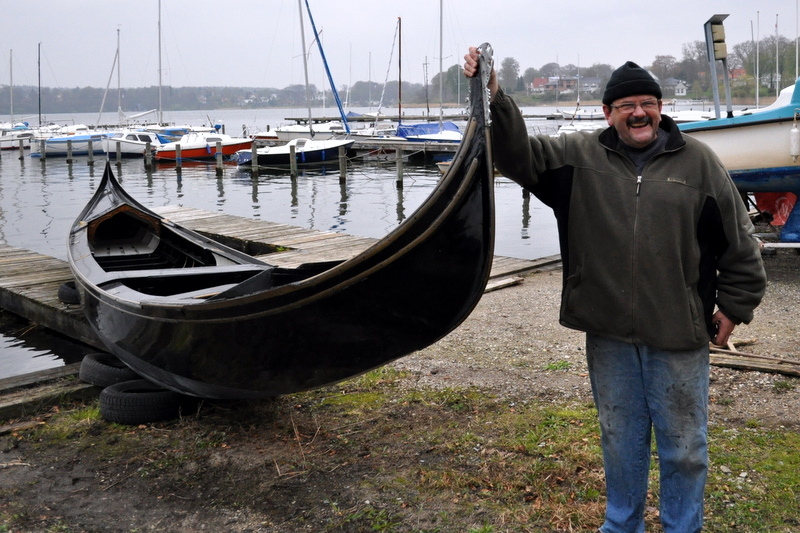 It originally appeared in my post "Ingo the Traveling German Gondolier". but they've all got life jackets. Athletes, actors, heck we'll even scrape the bottom of the barrel and row for politicians. Now and then we have the chance to row for someone really famous. Our friends in Coronado, California took someone particularly noteworthy out a while back. From the post "Santa Spotted near San Diego". He's a pro at pointing out the "sights" to his passengers. 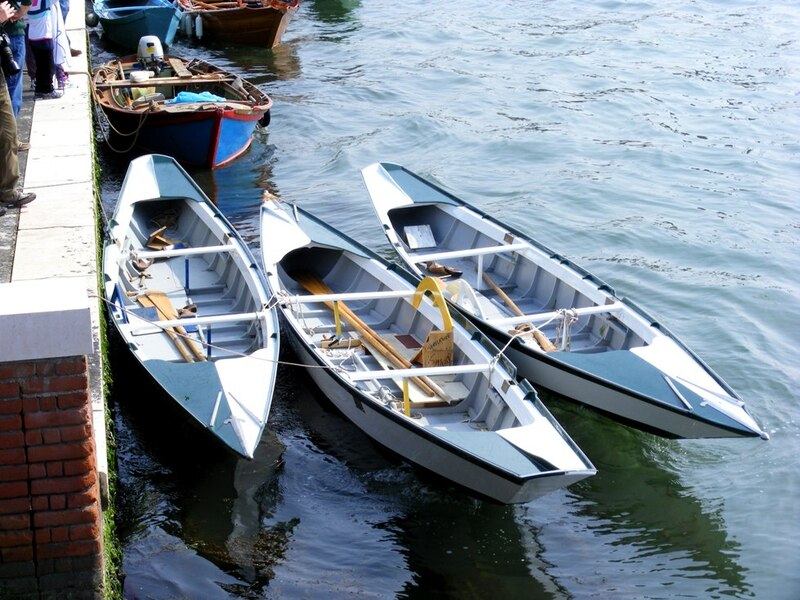 He'll row with one hand, and point out famous buildings and landmarks with the other. There's always something worth taking a picture of. or will end up forgotten in a short time. But that doesn't matter, they want to see it, and they paid for the experience. After all, we are in the business of creating that perfect moment. Pointing stuff out is part of the job. This image is from one of my earliest posts "GONDOLA FEVER" . Andres Garcia Pena, gondolier on the lake in Cantral Park, points out the famous Bethesda Fountain. He's tired at the end of the day. A hard-working gondolier puts every ounce of energy into the job. His ocupation requires both mental and physical exertion. This isn't a desk job, and it requires a lot more thinking than most physical vocations. We put our all into it. 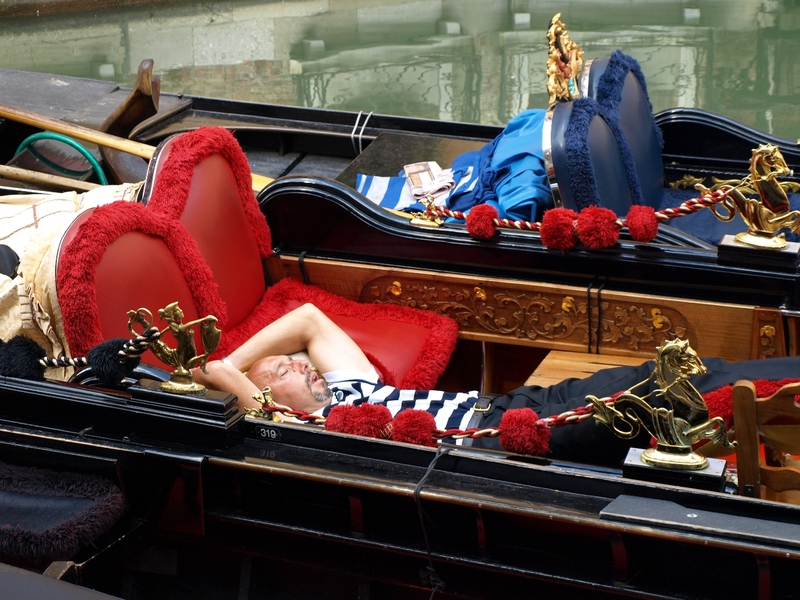 It's no surprise that the traditional "siesta" is popular among many gondoliers. The above photo is from one of my favorite posts - shot in Bacino Orseolo. Take a look at some of the other fun images of siestas in action at "Siesta". Hard-working gondoilers Don't always stand out, but they spend a heck of a lot of time standing up...on the back of a gondola. If you're rowing one, there's a good chance that you were trained by someone who matches the descriptions above. Anyone out there want to add an attribute to the list? Part 3 is in the works. Not surprisingly, Nereo Zane was in Venice for the Festa del Redentore this year and has posted some great images in his blog post "Redentore 2011". Filling the frame in an artful way is sometimes half the game in photography. Finding something interesting to fill that frame with helps too. 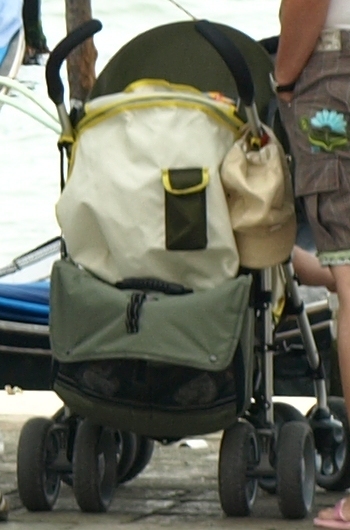 In the above image, Tamás caught a trio of mascarete which had been tied end-to-end in preparation for a towing across the lagoon. These boats are interesting to look at while being raced against each other. But they have a more subtle appeal when they're simply rafted up like this. Do something unusual, like tying them up in a long chain with a guy at the back to steer and fend off - and you've got the makings of a very interesting photograph. or if he was stuck with the job. While rowing together in Newport a while back, Chris Clarke and I landed on the topic of "one's first glimpse of Venice". He and I had both taken our first look at La Serenissima after walking out of the train station. Chris turned the phrase perfectly. He said "It's like a portal to another world". For me it most certainly was, and my first view of Venice could not have been more dream-like. casting a golden light on everything. Shadows and architectural details were enhanced. Vaporetti and water taxis cruised up and down the Grand Canal. Long black gondolas bobbed by with the sun's reflection playing along their complex curves. I had studied this place for many years, seen all sorts of photos and video, read up extensively, and yet that first encounter was breathtaking. 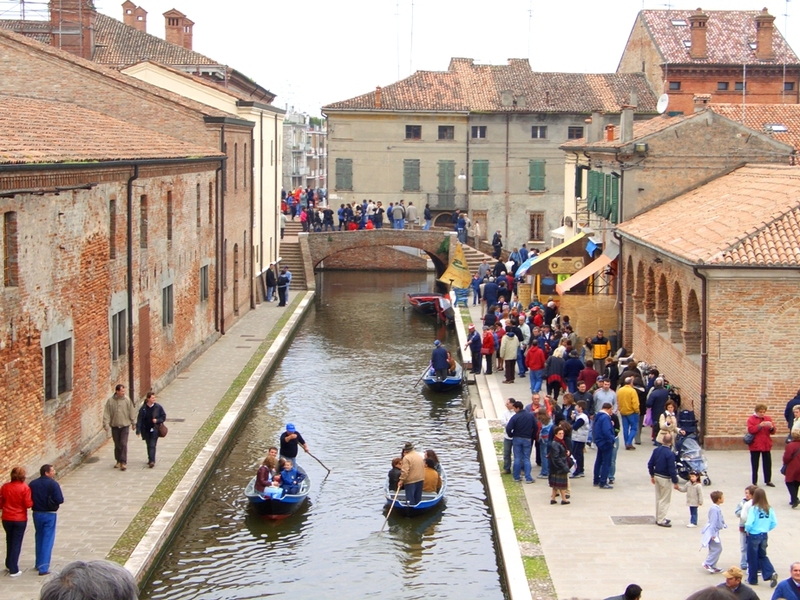 With the exception of cruise ship travelers, most visitors to Venice come in by road or rail. This section of the canal serves as the "first look" location for a multitude of jet-lagged, travel-weary, and over-stimulated people. Looking on her for the first time can be an emotional experience. 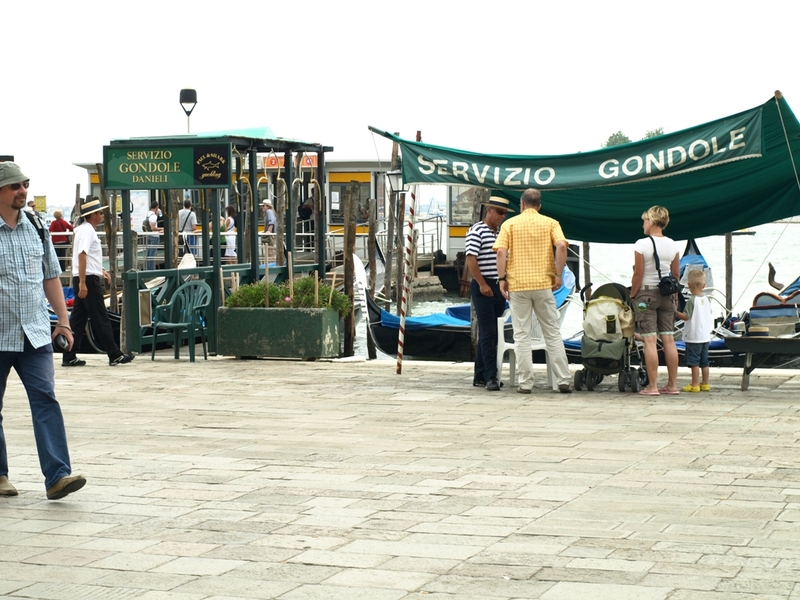 There are many gondola services along the Grand Canal, but the one I saw first was the "Servizio Gondola Ferrovia" - aptly named as it sits directly across the water from the train station. As it was explained to me by friends in Venice, "Ferrovia" essentially translates down to "iron road". This is not a very large operation, but they've got a nice little casoto, with all the trappings for a good picture. No doubt this place is photographed regularly. I shot this series of images early in the day, and as I aimed my long lens across the Canalazzo, I noticed some folks haggling for a gondola ride. 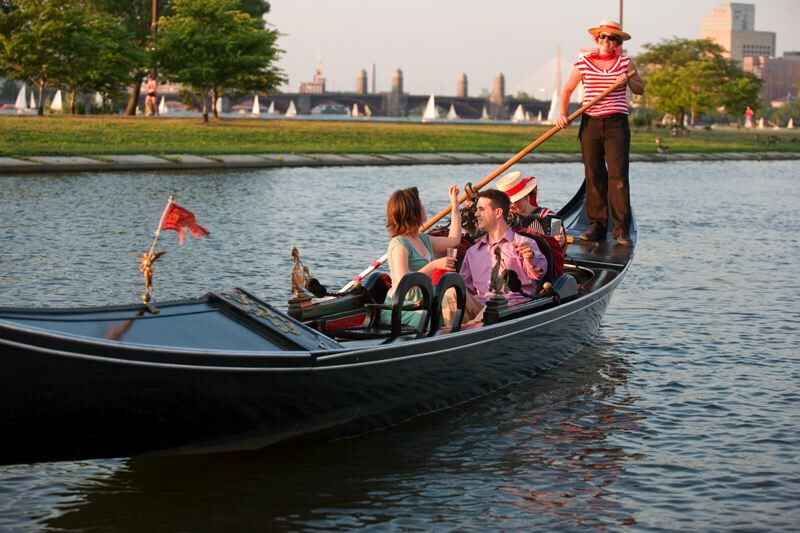 Soon after, a gondolier made his way to his boat and began primping her for the cruise that would likely begin soon. This was a nice gondola, with fresh paint, gold-leaf accents, and an eye-catching draped cloth from the back of the seat. It was clear that this guy took pride in his boat. Venetians are a funny lot when it comes to tradition, and new technology. I've met many who'd rather use a sessola (similar to an ice scoop), than hassle with a hand pump or shopvac. As many are purists, lots of gondoliers also gravitate towards a chamois, or "shammy" as many Americans call it, over towels or rags. he'd probably done the drill five-hundred times. 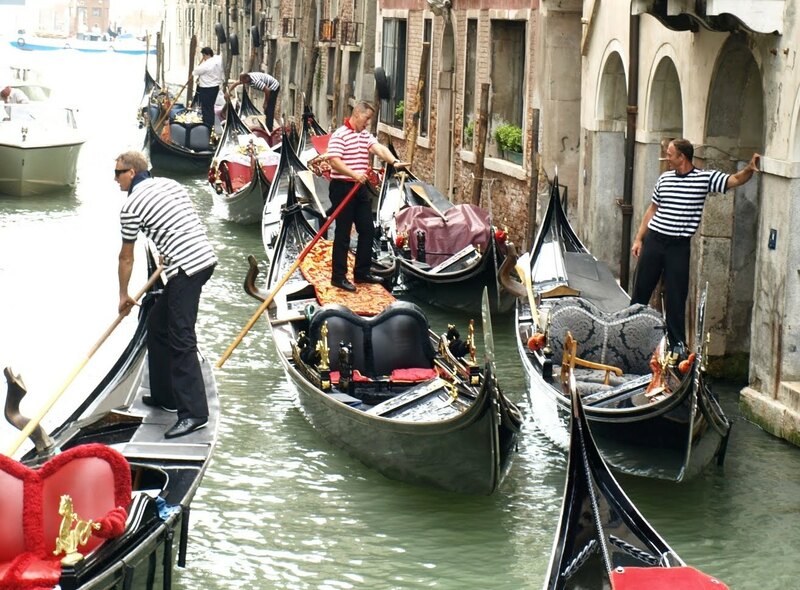 Funny thing - the gondolier with the chamois was done prepping the gondola before his potential passengers were done haggling over the details with the guy in the office. While thumbing through some photos, I came across a picture of one of my favorite people in all of gondola-dom: Megan Sliger. There she was, rowing along the Esplanade in Boston's Charles River. Her striped shirt and straw hat were perfect. Then I noticed something "imperfect": dirty knees. My first thought wasn't a criticism. I thought about how I try to keep the knees of my pants clean. and you drop to your knees just minutes before the passengers show up, and clean the floor of the boat. right before he welds together a gattling gun. So today's post is dedicated to all the hard-working gondoliers out there. I thought I'd assemble just a few attributes of a hard-working gondolier, but I didn't know where to stop. I ended up with more than I could include in one post. What began as an idea for a single post, appears to be well on the way to having three parts. As always, I welcome additional input from my friends out there. We have six attributes to consider this time. We'll begin with Megan as she inspired this list. A hard-working gondolier sometimes ends up with dirty knees. Because there always seems to be some reason to compromise a perfectly clean pair of pants to create the ultimate experience for our passengers. He can handle a little traffic. and can handle the boat flawlessly. 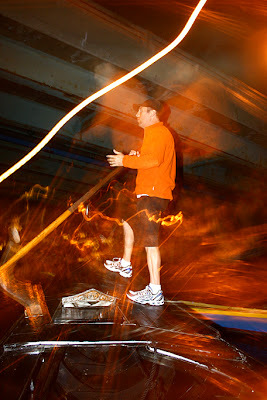 This photo was part of the post "S. Moisè - Gondolier Conversation". 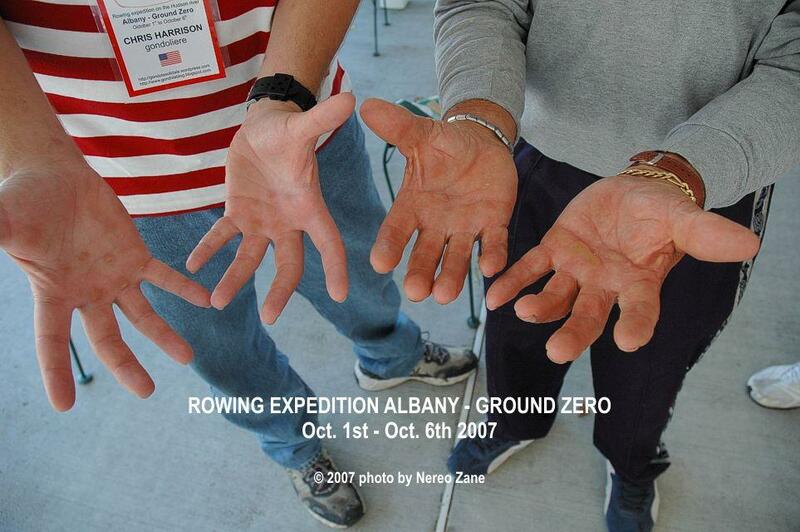 A hard-working gondolier's got calloused hands from all that rowing. These are the hands that can also be relied on to open jars, crush cans, and perform all sorts of other tasks. They are the hands that intimidate men with softer palms. 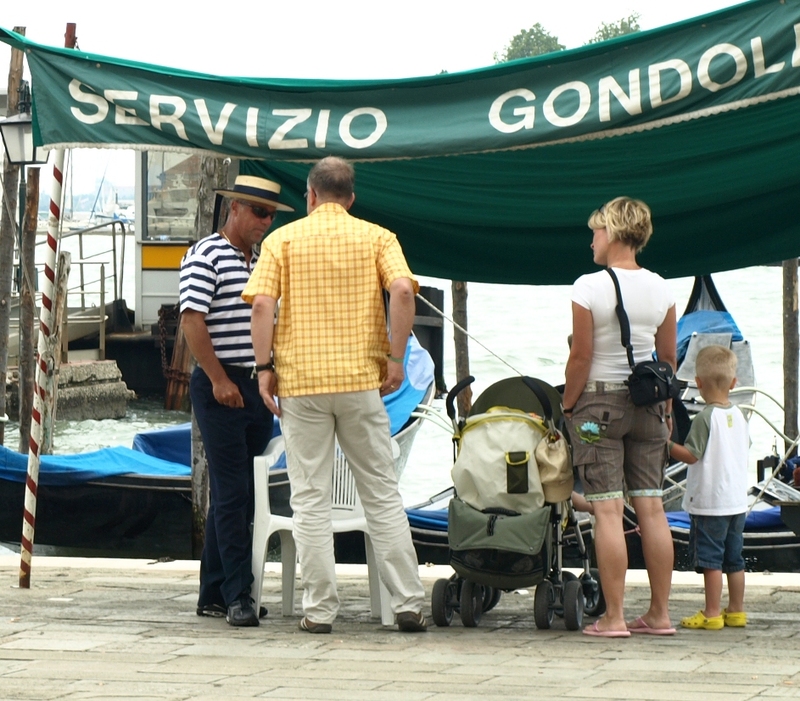 Just a handshake with a gondolier can communicate volumes. This photo was taken by Nereo Zane during the 2007 expedition down the Hudson River. The photo first appeared in the blog post "Hands". 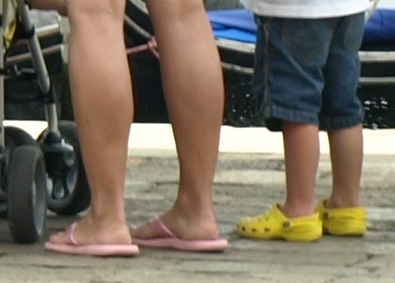 The hands belong to Chris Harrison (left) and Bepi Suste (right). Well, let's just say that they are easily "Chuck Norris approved"
36 feet of canvas doesn't scare him. The work's gotta get done. deserves to be covered - no matter how tired we may be. 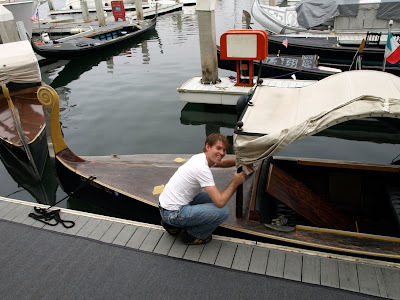 Minnesota gondolier John Kerschbaum rolling the cover of the "Lucia" before a cruise in Newport Beach, California. This photo was part of "And the Beat Goes On". He doesn't waste time with chit-chat. He's so busy that he's used to having conversations with co-workers on the water, and one-armed rowing is second nature. 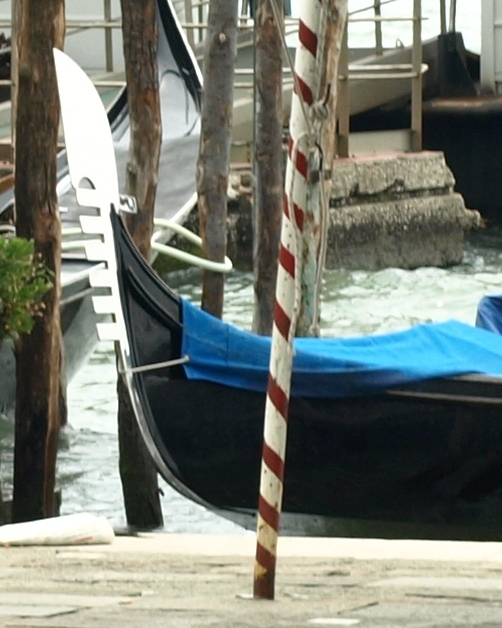 Hard-working gondoliers don't always have time to just sit around and gossip. They "catch up" on the water. In this photo we see John Synco and Ignacio Villanueva having a short exchange while passing each other in opposite directions. From the post "The Conversation". He's not afraid to do a little swimming. Sometimes it's not just a matter of getting your knees dirty. Sometimes you've got to fully commit. And then sometimes you get wet unintentionally. 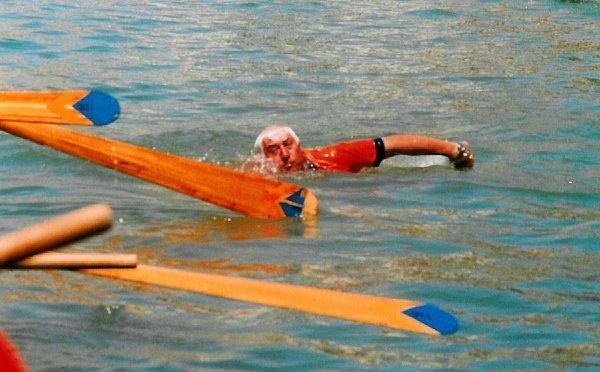 The post "What to do when you're the captain of a 14 man boat and you fall overboard during Vogalonga" contains the above image and many others, of a guy who went in the drink. Let's hope he didn't drink any of it. Hard-working gondoliers are among us. and other gondoliers take notice. Part 2 is on the way. And of course I'm open to suggestions. Once upon a time, someone posted some kind of irrelevant blather in a comment box here on the Gondola Blog, and in his ever-wry way, Sean Jamieson came back with a ridiculous barrage of pointless trivia about buttercows. Buttercows are, of course, cows sculpted from butter. Decades ago in Iowa, a woman named Norma Lyon gained attention for her remarkable skill at sculpting cows out of butter. These creations became all the rage at the Iowa State Fair. I wouldn't have known any of this if not for the fanaticism of Sean - gondola operator in Coronado, California, and afficionado of all things buttercow. After the comment exchange, "buttercow" became a slang term here for any comment deemed to be totally irrelevant. Someone would go off-topic, and someone else would simply write "Buttercow!" Or they would go into detail as to how that was a "buttercow remark". Folks were even accused of "buttercowing". A new bit of lingo was born right here on the blog. Of course it's probably not used anywhere else to describe what we call "buttercowing", but I still get a kick out of it. The buttercow lady has passed on. It could be said that she's gone to the Big State Fair in the Sky. But thankfully there are several others who now carry the torch, so there will still be buttercows out there - just not Norma Lyon originals. 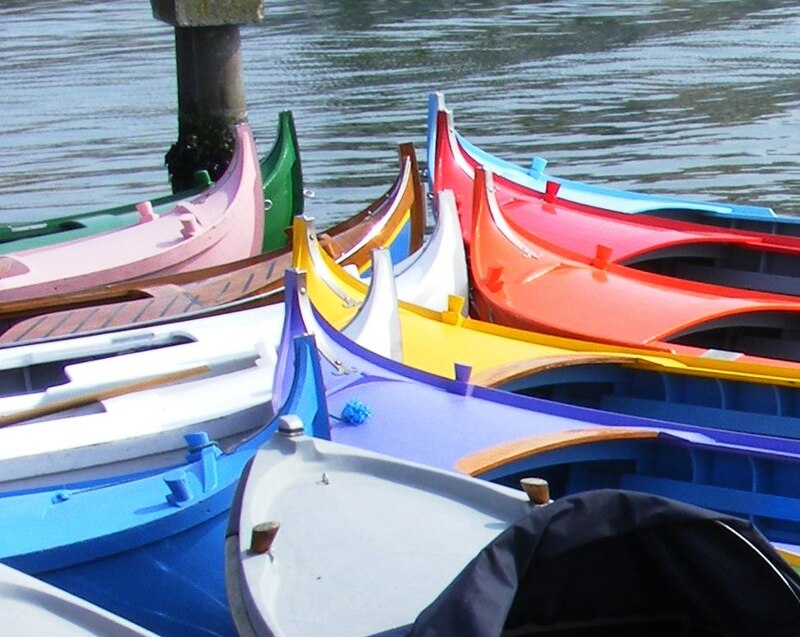 This whole post is totally off-topic, has nothing to do with gondolas, Venice, or any kind of rowing. Realistically, this blog post is a great big example of what it is to "buttercow". Thanks for the news, Sean. You know, this whole thing is entirely your fault. Now if you've read this post all the way to the bottom, then you're worthy of this next step. Feel free to launch your own bit of buttercowing in the comment box of this post. But make it weird, outrageous, or at the very least...off topic. I'm a gondolier and a photography fan. As the fanatic behind the Gondola Blog, both disciplines come in handy. I've already taken loads of pictures from the back of a gondola - many of which have been seen here. Getting a tripod involved isn't a new idea either. But mounting my beloved camera to the top of the tripod, and hanging it out over the water was a new exercise in faith. The timer setting was an important thing. So was a firm grip. Doing it all while rowing? and I was just brave or stupid enough to give it a try. Here's a shot with the lady's hand resting along the rail. Rowing in the tight canals added to the challenge. Getting the camera so close to the surface offers some great reflections. as we were approaching a message-in-a-bottle. Sure, I had plenty of blurred attempts, and shots that were almost right, but I came away with a few that I was happy with. I was also happy that I came away with a dry camera! I heard a rumor that Sunset Gondola is celebrating five years of operation. Congrats to Tim Reinard and his great crew of gondoliers on this milestone. I shot some video footage from various angles. Here's a little video I threw together using some of that footage. I hope the music isn't too cheesy - it seemed to capture the mood of "Ciao Venezia", which was exactly what "Bepi" was saying as he waved going under the bridge. It was the good-bye version of "ciao", as this was the last day the boat was in Venice, California. 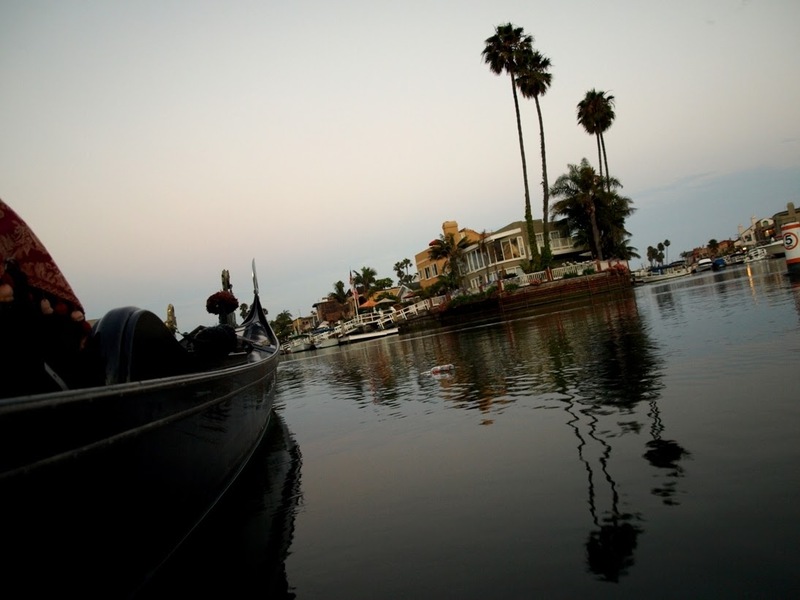 see Rowing in the "Other Venice" from earlier this week. Is it possible to imagine a better way for a group of friends to have a picnic, a voyage of exploration and possibly a bit of racing all in the same day than a Caorlina or two? of two brand new caorline he had the pleasure of rowing with friends. 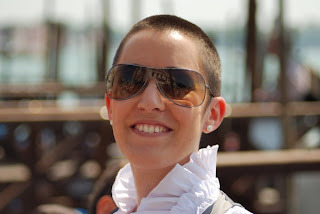 These photos were all taken on a trip from the Giudecca (San Biagio) around some of the deserted islands to the south of the city culminating in a delicious seafood lunch at Malamocco on the Lido. The Caorline were brand new and had barely been in the water. It was a great day, spent mainly trying to pretend that the two boats were not actually racing. Caorline come in all different colors. Looking at these two, I can't help but entertain the thought that the boat builder's wife just had twins - a boy and a girl. Tamás has a great eye for things. 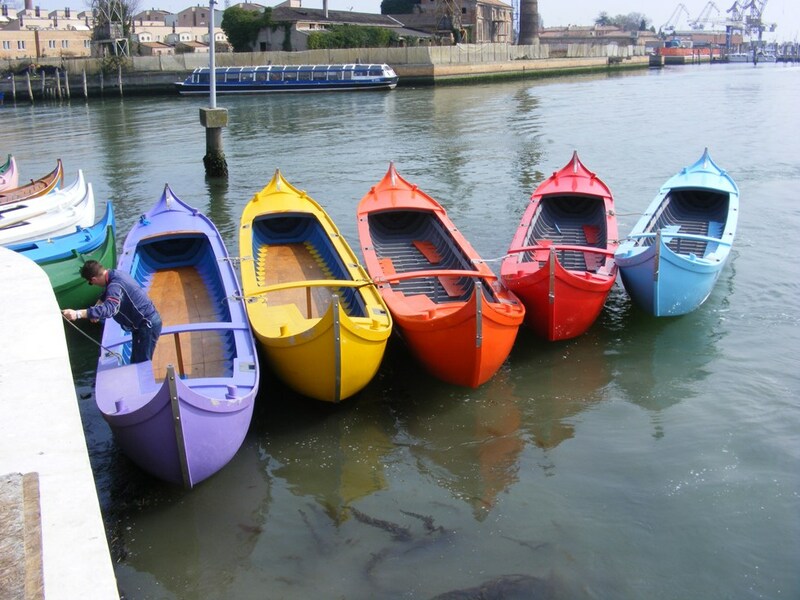 he spotted these caorline all rafted together and snapped a few shots. See if you can spot the "non-caorlina" in this bunch of prows. This group kind of reminds me of a roll of fruit flavored Lifesavers.